MIROSLAV TICHY HAS BECOME FAMOUS in spite of his need for privacy. Born in 1926 in what is now the Czech Republic, Tichy studied painting at the Academy of Art in Prague until the Communist takeover in April 1945. Arrested for being “odd,” therefor subversive, Tichy spent many years in jails and prisons, until he was released in the 1970s. Upon his release, he wandered his small town in rags, pursuing his occupation as an artist photographing the female form in the streets. 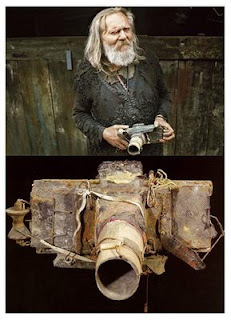 He made his cameras from tin cans, childrens spectacle lens and other junk he found on the street. He would return home each day to make prints on equally primitive equipment, making only one print from the negative he selected. He stole intimate glimpses of his subjects through windows and the fences of swimming pools as well as in the streets, sometimes finding himself in trouble with the police.